Lance Gardner began his baking journey at the age of 10, sitting on the worktop tasting his mum’s raw cake mix from the spoon. 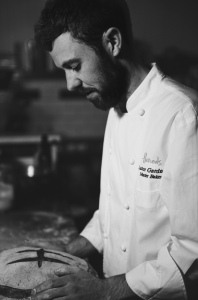 His early passion for baking turned into a full-time job working for French master baker, Richard Bertinet, as a junior baker. Under Richard’s tutelage, Lance learned the fundamental skills of bread making, shaping and baking good bread. Lance then moved on to Harts Bakery in Bristol, undertaking his first head baker’s role. It was at Harts that Lance really began to express himself as a baker through flavoured breads and lamination, which led to a prestigious role setting up a bakery in Harrods Food Hall. Starting an artisan bakery from scratch, developing a sourdough bread range and redeveloping the existing lines of savoury and sweet product ranges, marked a milestone in Lance’s professional career. Lance is now excited to share his knowledge and expertise with the Bread Ahead community.